As you know, the winners of all the continental cups gets to start the World Cup season. There are also intermediate rankings during the season that allows the current continental cup leaders to join the WC’s. My son , the skier, was wondering if you could do a comparison of how well the leaders and winners of continental cups fare when on the WC circuit? More specifically, how do Canada’s and the USA’s leaders and winners WC results compare to other continental cup skiers? Or have you already done this and I have missed the post? In particular, the starts awarded to the intermediate leaders during a season will be the hardest to track. Also, there’s the issue that sometimes the nominal Continental Cup leader may decline the starts, or be ineligible (wrong nation of origin) so you’d have to filter out those cases too. To avoid getting lost in the technicalities of Continental Cups, let’s look at something that’s pretty close to the original question: take the top three skiers in each Continental Cup series at the end of a season, and look at how they did in the 1st period World Cup races the following season. This will allow us to address the question of how the “best” Continental Cup skiers from different regions compare on the WC, without getting bogged down in too many details. Even though I’ve expanded this to the top three, rather than just the winner, it’s important to note that these results will be very strongly influenced by a single very strong skier from a particular region (I’m thinking Justyna Kowalczyk here, but there are other examples). But this also means that it’s tough to glean any general trend, since the results from any particular region will be so strongly dependent on whether they happen to have a “super star” that year or not. 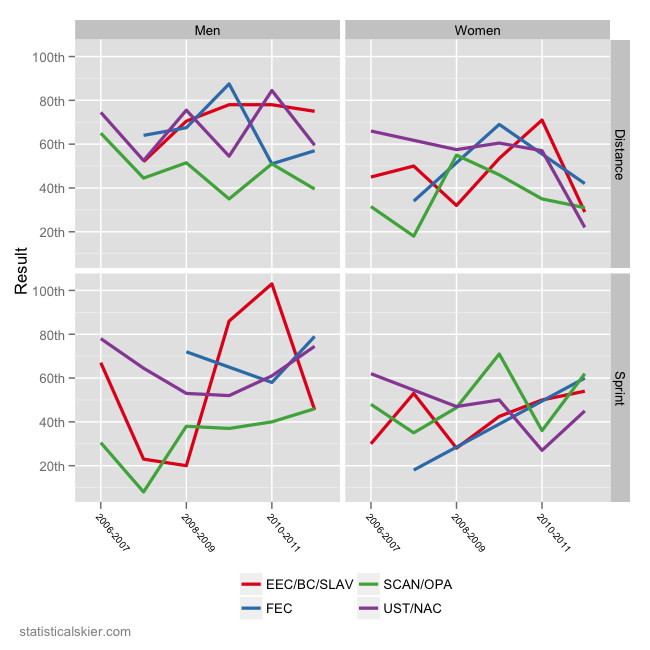 That said, I do think it’s clear that the Scandinavian and OPA Cup skiers are generally stronger on the men’s side. The women’s field, not surprisingly, is a little more mixed. The recent good fortunes among the women’s UST/NAC skiers is probably in large part to Jessie Diggins/Holly Brooks. Posted by Joran on Wednesday, April 11, 2012, at 6:00 am. Filed under Analysis, Cross Country. Tagged Analysis, continental cup, World Cup. Follow any responses to this post with its comments RSS feed. You can post a comment or trackback from your blog.